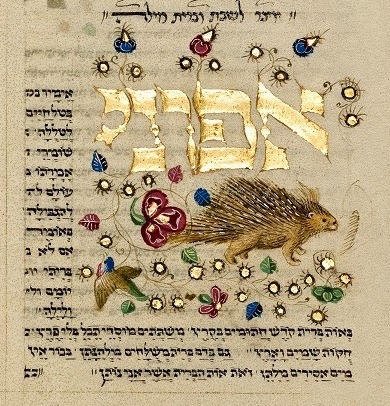 R' Natan Slifkin, in this recent blog post, presents the above-embedded picture of a porcupine from the Rothschild Miscellany (Italy, 15th Century CE), which adorns a yotzer (seasonal additional prayer-poem) that's said when a berit milah is performed on Shabbat. He is wondering what the intention of the illustrator was: What does a porcupine have to do with a berit milah? Browse other questions tagged shabbat jewish-books animals brit-milah symbols-symbology .